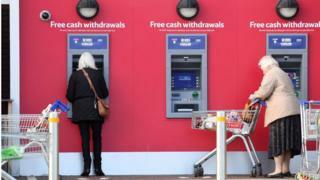 Plans to shake-up the UK's ATM network may leave many remote areas with little or no access to cash, consumer group Which? has warned. Link - which manages the network - says there are too many cash machines in places where they are not needed. Which? said it could lead to "mass closures" of free-to-use machines. According to the consumer group, more than 200 communities in Britain already have poor ATM provision, or no cash machines at all. It said 123 postcode districts did not appear to contain a single ATM, making many consumers reliant on access in nearby villages or towns. and YO13 in North Yorkshire (10,110). Gareth Shaw of Which? said: "Link's proposals could place a strain on communities across the UK that are already struggling to access the cash they need following mass [High Street] bank closures. He said that those hit hardest would not be busy high streets, but ATMs in rural communities. Link says it wants to lower its fees to card issuers by 20% over the next four years, from 25p to 20p per transaction. This would make it less profitable to run an ATM in many areas. However, it says there are too many cash machines in places where they are not needed, with around 80% located within 300 metres of other ATMs. It said the number of free-to-use machines had rocketed from 36,400 in 2007 to 54,950 last year. John Howells, chief executive at Link, said: "The UK has one of the largest free-to-use ATM networks anywhere in the world, and the number of free ATMs is at an all-time high and rising. He said the organisation would protect free-to-use ATMs that are a kilometre or more from the next nearest free cash machine. It plans to extend its Financial Inclusion Programme, which subsidises ATMs in less affluent and rural communities.